Most of us enjoy deep fried foods such as potato chips, fish, chicken, French fries, just to name a few. 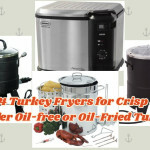 Especially when done at the right temperature and using the proper amount of healthy oil, a good deep fryer will give the final meal a crispy texture and an appetizing browning appearance. 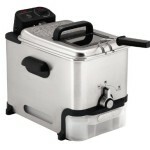 One of these good deep fryers in the market is the electric 4.2L deep fryer from Secura. The Secura electric deep fryer is a cooking appliance that comes with 3 frying baskets with a total handling capacity of 4.2 liters or 17 cups, making it a suitable kitchen appliance for family meals. 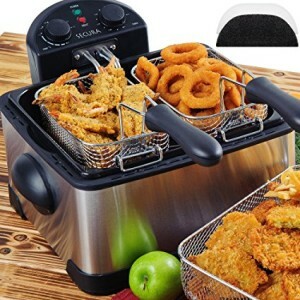 The 1700-watt appliance also consists of a magnetic safety plug, and a splatter protecting lid as well as a removable oil tank to ease your frying and post-cooking experience with the device in the kitchen. It also features an automatic adjustable timer and temperature control functionality, which allow you to regulate your cooking heat to ensure even cooking and monitor your meals as they get cooked within a span of up to 60 minutes. To reduce kitchen odors, the Secura electric fryer also comes with carbon activated filters, a feature that beats most of the alternative fryers in the market. 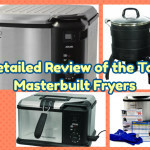 This deep fryer is made of stainless steel body, which makes it tremendously durable and features a viewing window so that you don’t have to remove the fry basket to take a look at your food. The wire baskets come with a detachable handle that allows convenience when lowering and lifting your food into and out of the fryer. The fryer allows you to hang the wire baskets on the edges of the appliance as you prepare your food before cooking. 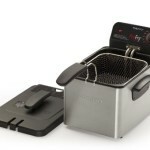 3 Fry-Baskets: One unique feature of the Secura 4.2l electric fryer is that it provides you with the ability to multitask in the kitchen, thanks to its triple frying baskets. There is one large basket, along with two small baskets that can be used for smaller batches of food. 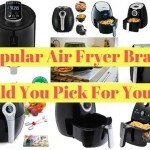 it also makes it convenient to cook different foods that require different frying times. 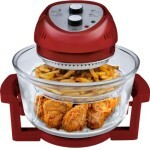 What’s more, the baskets come with detachable handles for easy lowering and lifting of foods into the fryer. 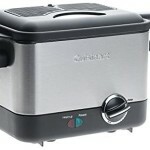 Immersion Element: The 1700-watt Secura 4.2l/17-cup electric stainless steel deep fryer is also quite economical when it comes to oil usage in the kitchen. This is made possible by the 1700-watt immersion heating element, which allows faster recovery of the oil temperature. It also saves energy big-time as the immersion element allows preheating as well. 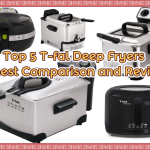 These, along with the fact that the heating element is equipped with a thermostat to regulate cooking temperatures make this deep fryer a winner in comparison to alternative brands and models. Removable 4.2-liter Oil Tank: For ease of use and cleaning after cooking, this awesome deep fryer comes with a removable oil tank with a 4.2-liter capacity. This capacity also reduces the need to keep on adding oil in between meals or the cooking process. 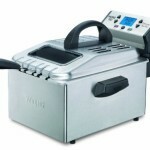 Sturdy Construction and Magnetic Plug: The fact that this electric deep fryer is made of stainless steel makes it easy to maintain and clean. Also, the material won’t scratch or rust easily, meaning that the appliance is adorable for durability. To minimize the risk of occurrence of kitchen accidents, say by tripping over the electric plug, the device uses a magnetic plug, which becomes detached to avoid electrification. Adjustable Heat Control: Another great feature of the Secura 1700-watt 4.2l electric deep fryer is the adjustable heat control function located on a control box attachment. This allows you to cook your food at just the right temperature conditions to achieve the desired quality especially in terms of flavor and appearance. Upon reaching the desired temperature, the heat light automatically goes off. 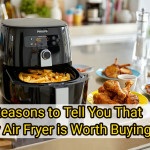 Automatic Timer: The fryer is also equipped with an automatic timer that allows you to input timing presets to cook your food at a constant temperature. The automatic, adjustable timer allows up to 60 minutes and automatically shuts down the heating element once the preset time elapses. 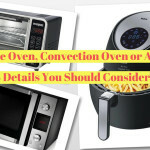 This means that you can comfortably cook your food without worrying that it will overcook or get roasted while attending to other household chores. Most users find it adorable and considerably cheap for its convenience of use and the quality of food it produces. 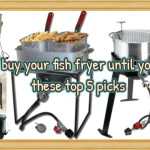 It can be a great appliance for deep frying chicken wings, potato chips, French fries, fish, and other favorite dishes you like deep frying. Most consumers deem it suitable for their cooking applications especially when preparing different types of meals without necessarily supervising the whole process. Plus the removable parts make it a winner over most alternatives as it is easy to clean up oil spillages. The Secura electric 3-basket deep fryer is adored by families and users with small kitchens since for its convenient capacity yet a compact appliance that doesn’t consume a lot of space. In conclusion, the Secura 4.2l electric 3-basket deep fryer is a perfect appliance for use in preparing considerably large family dishes such as fish, chicken, and chips. It saves you time, energy, and space, thanks to its adjustable and automatic features as well as the immersion preheating element and its compact size. It can also be used by small household consumers as well as small scale commercial kitchens such as restaurants. 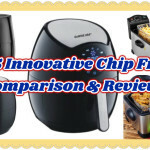 We highly recommend this product if an affordable, convenient, easy-to-use deep fryer that produces quality meals is what you’ve been looking for in the market.